In 1983, HELMEPA began a concerted summer awareness campaign starring the association’s “Seagull”, taking place every year since then, with the aim to spread the message for Clean Seas and Beaches to the general public. 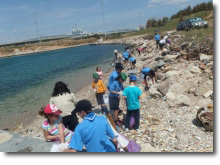 In this context, for the first time in Greece scouts and schoolchildren participated in voluntary beach cleanups, primarily in the region of Attica. Since then, beach cleanups have been established as a key information and awareness tool for the prevention of marine litter pollution. 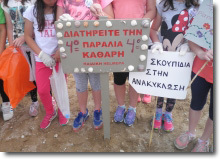 Moreover, the adoption and cleanup of a beach constitutes the most popular activity of the “HELMEPA Junior” environmental education program, which since 1993 is offered to schoolchildren, 5-13 years old, in kindergartens and primary schools throughout Greece. The association’s Environmental Awareness Section coordinates in Greece two international voluntary initiatives: the International Coastal Clean-up Day and the European Clean-Up Day taking place in September and May respectively. 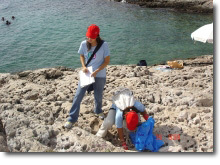 As the national coordinator of these activities in Greece, HELMEPA invites its member-companies, local authorities and concerned citizens across the country, to contribute to this initiative by devoting a few hours to cleanup a nearby beach, a section of the seabed, a river bank or lake, a forest area or park. To facilitate the activities of the participants, HELMEPA provides them with supporting material (cleanup organization instructions, posters) and the special Trash Data Form, which should be completed and sent back. Moreover, HELMEPA contributes to the promotion of such voluntary activities throughout Greece and abroad. The processing of the recorded information results in useful scientific data pertaining to quantities, composition and origin of waste, which are made public in order to raise awareness for pollution prevention. 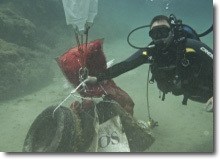 By enriching the database that HELMEPA has established, the association is monitoring the trend of marine debris pollution in Greece and cooperates with national and international bodies (United Nations Environment Programme – UNEP/MAP, European Environment Agency, Ocean Conservancy, Algalita, etc.) on combating this problem in a more efficient way. 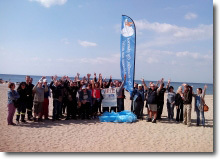 The International Voluntary Beach Cleanup for 2017 was organized and coordinated in Greece by HELMEPA between 16 September and 16 October. In total, 99 beach and underwater cleanups were organized by 108 private and public entities. Once again this year it is worth noting the extensive participation of the educational community. Members and volunteer teachers of the “HELMEPA Junior” Program, young volunteers-Cadets and kids from 55 Kindergartens, Primary and High Schools sent their environmental message to the adult community. Participants also included representatives of Municipalities, Coast Guard officers, staff of Environmental education Centres, members of environmental organizations, clubs and societies, divers and other sensitized citizens. Under the motto “We clean what we left behind us during the summer”, the volunteers, apart from collecting the waste, contributed to HELMEPA’s research regarding the quantities, composition and origin of waste. The data that the volunteers provided, is being forwarded to Ocean Conservancy, the global coordinator of the initiative, in order to include it to the overall results. Cigarette filters were once again for 2017 at the top of the list, accounting for 37% of the total number of the items collected (namely almost 1 in 3 items are cigarette filters). During the last years, the list is filled almost entirely with plastic waste, associated with recreational activities in the coastal zone, polluting every “corner” of our seas and beaches. Especially microplastics are one of the environmental challenges of our time, because they serve as a new type of “food” that invades uncontrollably into the sea food chains, as seabirds, fish, marine mammals as well as smaller organisms consume this deadly “delicacy”. Out of the 6,8 tons of litter collected, 1,3 tons were recycled in cooperation with the Hellenic Recycling-recovery Corporation (He.R.R.Co.). Unfortunately, for yet another year, many household items were also found discarded along beaches, such as 86 electrical appliances, 1 heater, 15 chairs, 1 quilt and 2 carpets, 3 gas cylinders, but also various articles of clothing and footwear, such as 72 pairs of shoes and flip-flops! What is more, many pieces of trash that are dangerous to human health, like the 355 batteries, 164 used diapers and 92 syringes, not to mention the derelict fishing gear among which were 685 metres of synthetic netting and 1,006 metres of rope, as well as 469 tires were found lining our coasts. Commemorative participation Diplomas were awarded to the coordinators of the actions, as well as the children and youth that participated.